Cardiovascular disease is the second leading cause of death in Canada, after cancer, claiming more than 33,000 lives per year. Although the instance of CVD is increasingly common as we age, it is certainly not an inevitable consequence of aging. 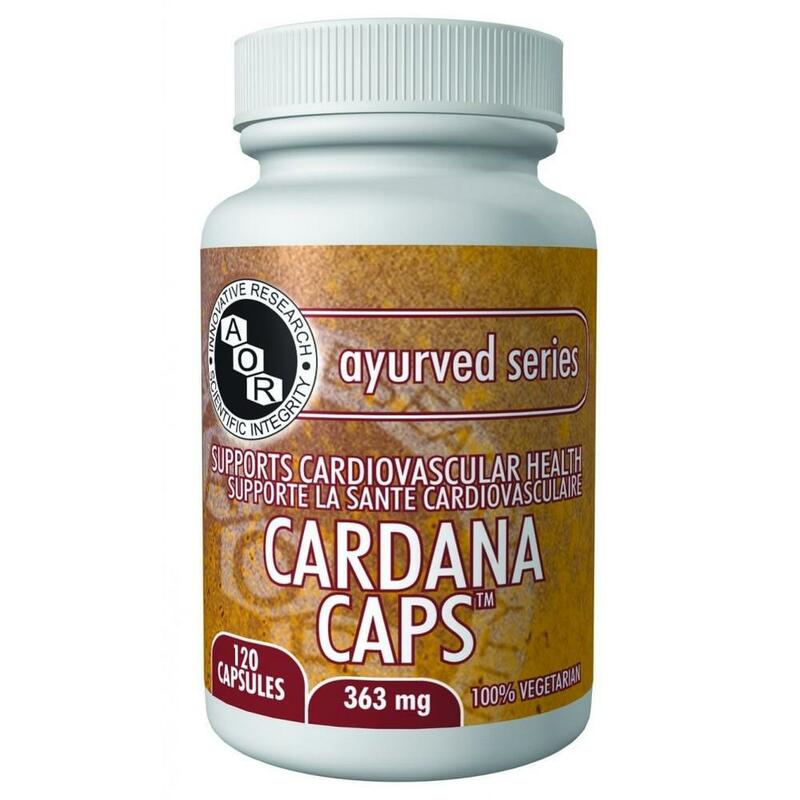 Cardana is an Ayurvedic herbal formula designed to support the health of the heart and cardiovascular system. It reduces the effects of stress on the heart by promoting normal blood pressure range and healthy blood flow to the heart muscle. Cardana is a preparation of botanicals used in traditional Ayurvedic Medicine that helps to support and maintain cardiovascular health in adults. It contains five of the most powerful herbs — terminalia arjuna, coleus forskohlii, crataegus laevigata, boerhaavia diffusa and withania somnifera (ashwagandha) – to increase the strength of the heart’s contractions, improve the force and efficiency of heart contractions, and reduce the oxygen needs of the cardiac muscle. This formula of powerful anti-hypertensive and anti-arrhythmic agents is ideal for those looking to maintain healthy blood pressure and improve their heart function. It can also deliver results to Type A personalities who have a higher incidence of heart and blood pressure problems. Caution: Do not use if you are pregnant or breastfeeding. Consult a health care practitioner prior to use if you are taking cardiac glycosides such as digitalis or digoxin, or any blood pressure medication, diuretics, anticoagulants or blood thinners. Consumption of this product with alcohol, other drugs or natural health products with sedative properties is not recommended. Consult a health care practitioner if symptoms persist or worsen. Mild gastritis, constipation, headaches and vomiting have been known to occur, in which case discontinue use. Clinical Pearls: “After decades of using this amazing Ayurvedic formula, it certainly holds a permanent place in my dispensary for heart health. There are actually very few natural agents that can exert therapeutic benefits on elevated blood pressure like Cardana can while at the same time strengthening the heart. Add to this, little, if any troubling side-effects.” David Sloan, PhD, NNCP, RNT. Clinic Director – Sloan Natural Health Center. Disclaimer: The information and Product Descriptions appearing on this website are for information purposes only, and are not intended to provide or replace medical advice to individuals from a qualified healthcare professional. Consult with your physician if you have any health concerns, and before initiating any new diet, exercise, supplement, or other lifestyle changes.